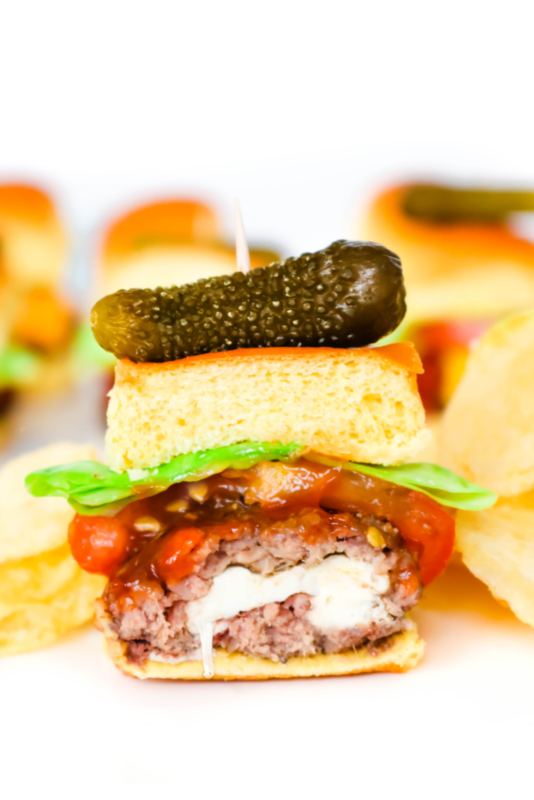 These sliders are stuffed with fresh mozzarella cheese, air-fried and topped with your favorite toppings to create the most amazing Stuffed Cheeseburger Sliders! 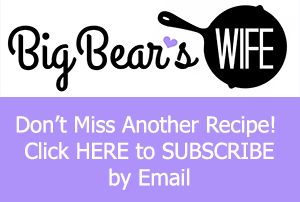 These are perfect for game day parties or weeknight dinners. This post/recipe sponsored by Martin’s Famous Potato Rolls and Bread. All words and opinions are 100% mine as always. I’m a cheeseburger person, not a burger person. There is just something ridiculously satisfying about biting into a perfectly cooked burger and your taste buds getting hugged right away with ooey, gooey melted cheese. So, it should be no surprise to y’all that I fell in love with cheese-stuffed burgers when my husband started making them at home years ago. 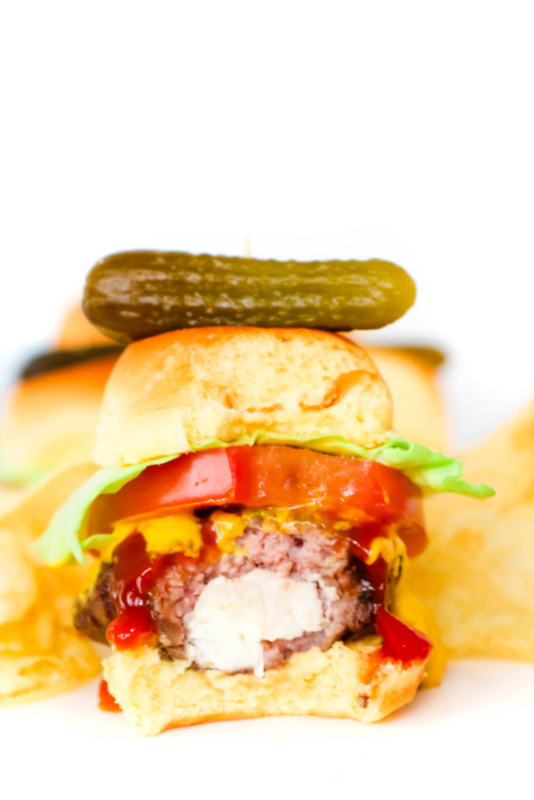 We experimented with different cheeses, different types of toppings and methods of cooking these tasty cheeseburgers in order to figure out how to make them perfect for us. My husband loves his grill and he will get out on the patio and grill all throughout the year. However, I’m not interested in standing in the cold to grill anything. I stick to the kitchen for all of my cooking during the winter which is where these Air Fryer Stuffed Cheeseburger Sliders came from. YES! 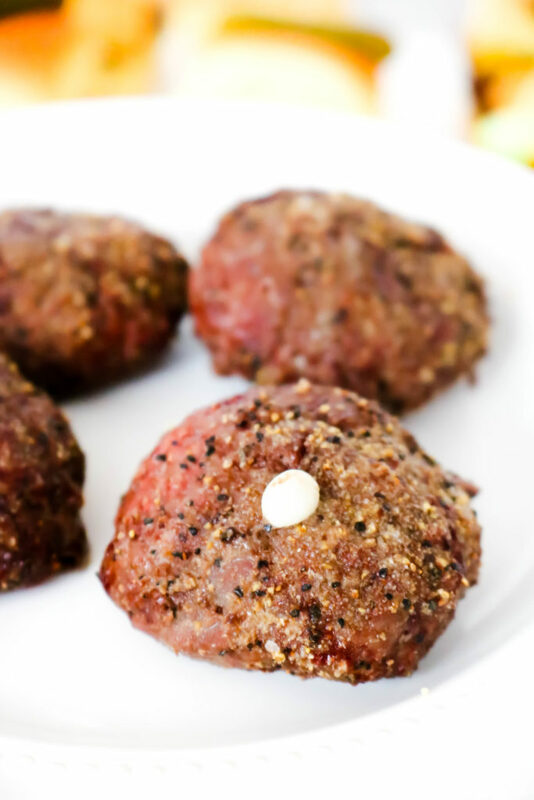 Cheese-Stuffed burgers cooked in an air-fryer are delicious! While normal size cheeseburgers are fine, I love making these into sliders with Martin’s Famous Party Potato Rolls. These potato rolls are so good and they’re the perfect size for these Air Fryer Stuffed Cheeseburger Sliders. With these Air Fryer Stuffed Cheeseburger Sliders being smaller I can cook at least 3-4 at a time in the air-fryer. Plus, to be honest, the little slider sizes are perfect for my son and I. Thomas, on the other hand, eats about 3 of them haha. We are pretty simple with it comes to seasonings when we make cheeseburgers. I think that a little garlic powder, salt, and pepper is really all you need to season these before they’re cooked. Of course, you can season them however you’d like! Let’s talk cheese real quick before y’all get to the recipe below. There are so many different cheeses to choose from out there. While I always encourage everyone to experiment in the kitchen to figure out exactly what they like, I thought I’d let you know what cheeses we have found work best for these Air Fryer Stuffed Cheeseburger Sliders. My first choice is fresh mozzarella. No block mozzarella, no pre-shredded mozzarella, fresh, sometimes pre-sliced mozzarella cheese is my go-to cheese for stuffed cheeseburgers. The second choice for stuffed cheeseburger cheese would have to be sliced American cheese. Sliced American cheese folded over onto itself to make a little cube and stuffed into a burger melts very nicely! Third, we’re going to have to go with gouda cheese. I find gouda a little hard to slice for burgers but cutting it into cubes for stuffed burgers works out pretty well. 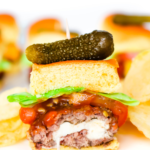 If you’re serving these at a game day party, a “build your own slider” station would be awesome. Just set out a ton of different toppings and as the fresh, hot sliders are ready, guest can grab one and make their very own sliders. If I was going to be making these for a party, I’d have the patties already stuffed and seasoned ahead of time. Then when guest started to arrive, I’d start cooking them up in the air-fryer. 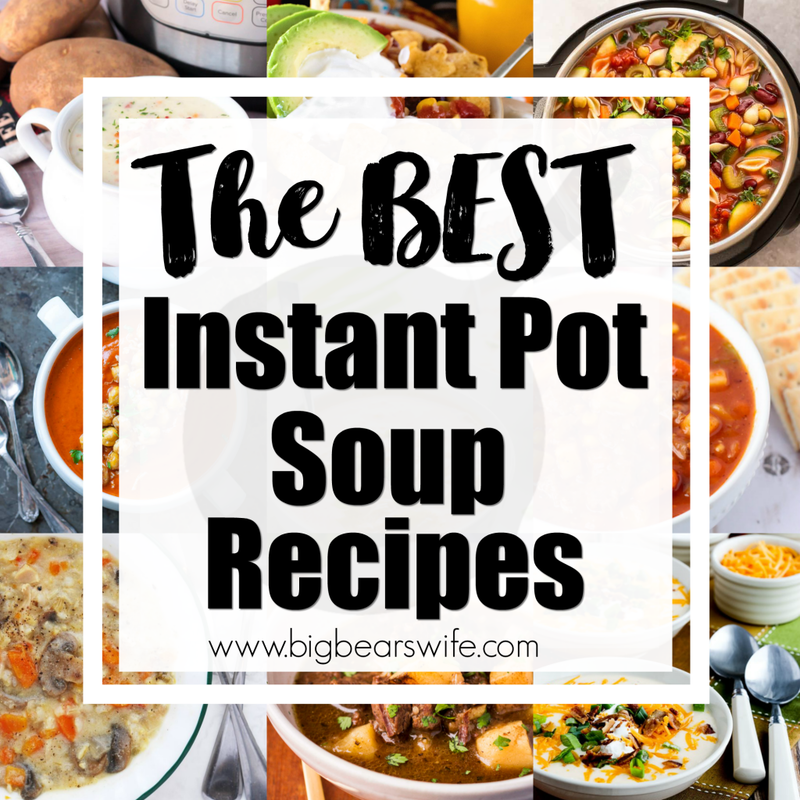 If you have a lot of guests and need to make a lot, you would start ahead of time and keep them warm in the oven as you’re making them and then set them out when it’s time to eat. 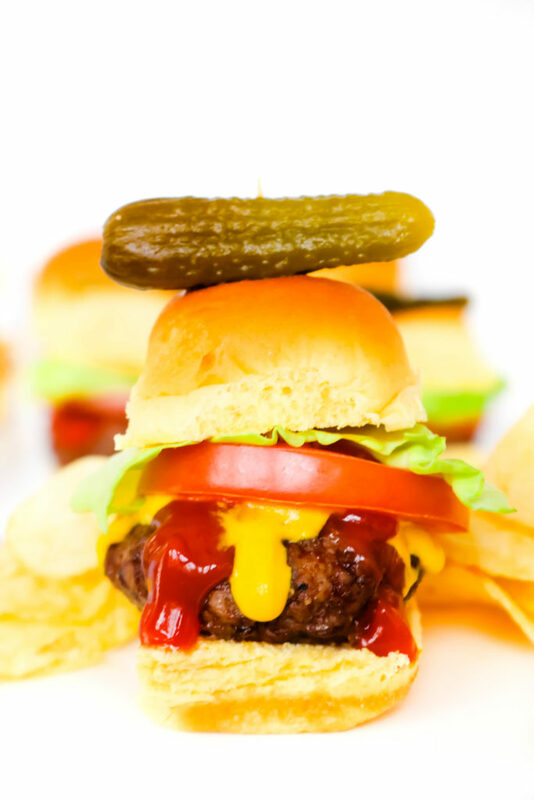 As far as toppings go for Air Fryer Stuffed Cheeseburger Sliders, the sky is the limit. 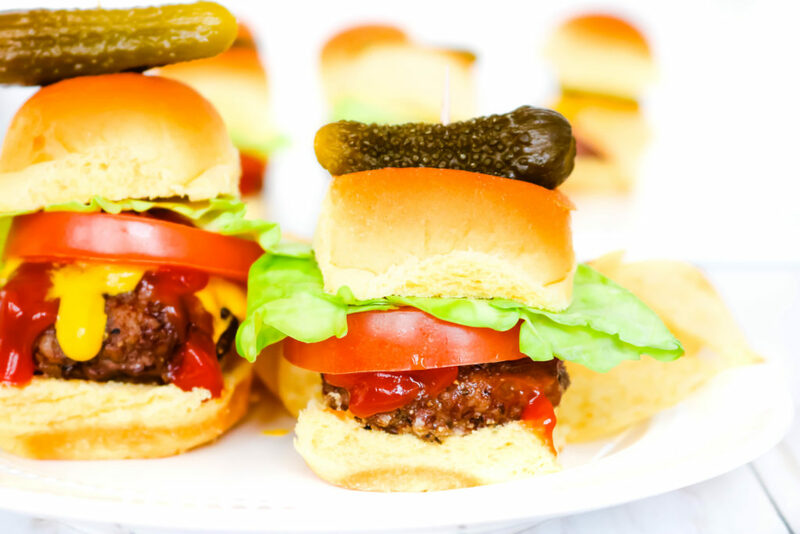 Really, you can top these sliders with anything that your heart desires. I like lettuce, tomato, ketchup and mayo on my Air Fryer Stuffed Cheeseburger Sliders. However, Thomas loves extra American cheese, pickle slices, and mustard. What would you top your sliders with? 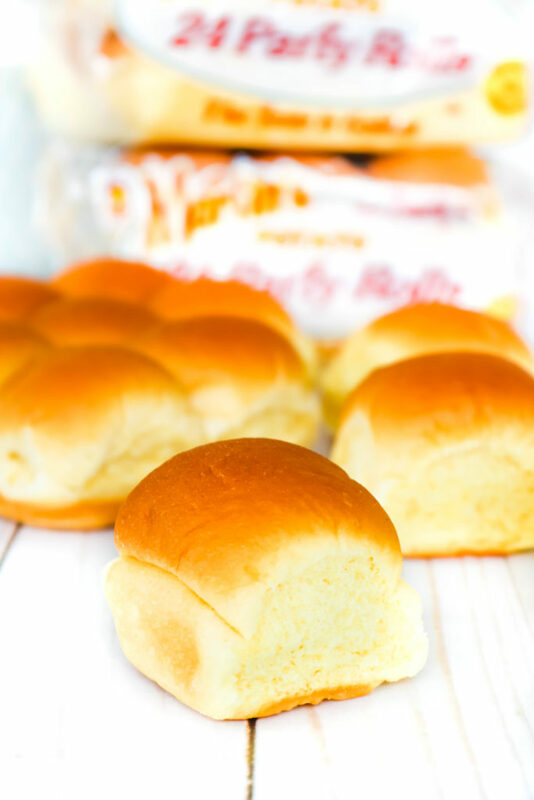 I’ve partnered with Martin’s Famous Potato Rolls and Bread for a friendly recipe competition and a little giveaway! It’s a Team Multi-Pot or Team Air Fryer competition using Martin’s Famous Potato Rolls and Bread! As you can probably guess, I’m on the Air Fryer Team! 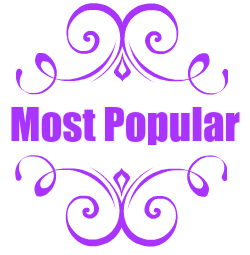 The Winning Team will be announced Monday, February 4, 2019 and a random voter from the winning team will win a Ninja Foodi. PS. Thomas and I are celebrating our 12th wedding anniversary on Sunday, February 3, 2019! So you can vote TEAM AIR FRYER as an anniversary present for us. haha! So GO VOTE! 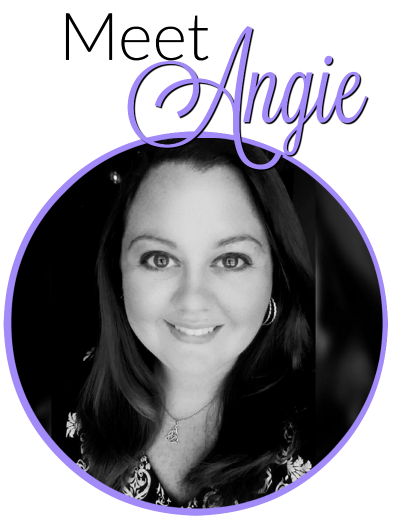 VOTE TEAM AIR FRYER! Use 1 1/2 tablespoons ground beef per slider burger patty. Roll slider burger patty into a ball. Use your thumb to press an indention into patty. Add a small piece (about 1/2 inch piece) of fresh mozzarella cheese to center of patty. Fold over sides to enclose cheese into ground beef. Flatten burger patty to about 1/2 inch thick and about 3 inches wide. Season each side with some of the garlic mixture. Cook cheese stuffed slider patties (3 or 4 at a time) in an air fryer at 350F for 10 minutes for a medium to medium well burger. 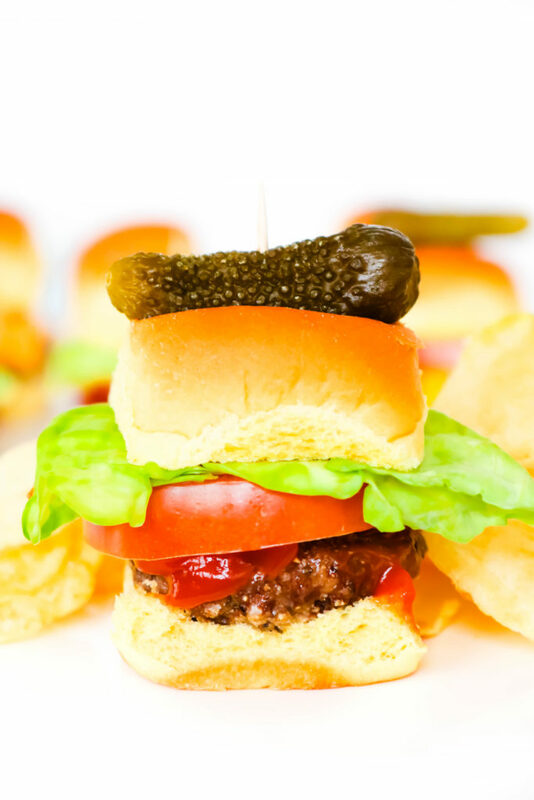 Place sliders onto Martin’s Party Potato Rolls and top with your favorite cheeseburger toppings! 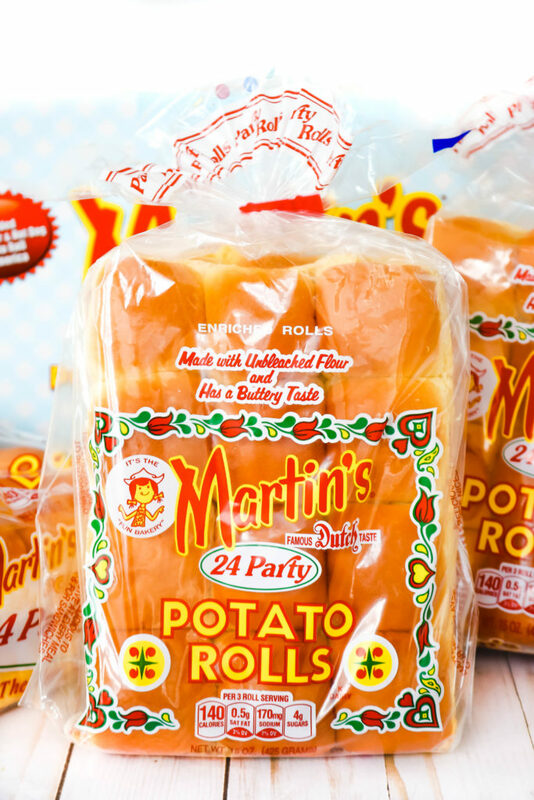 Want to find out more about Martin’s Famous Party Potato Rolls? Visit them on Facebook, Twitter and Instagram! Adding this to my gameday menu! I am positive they would be a hit with my guests. Love this idea! Can’t wait to make these sliders! These would be just perfect for a game day party! Those rolls are so soft and always perfect for burgers! 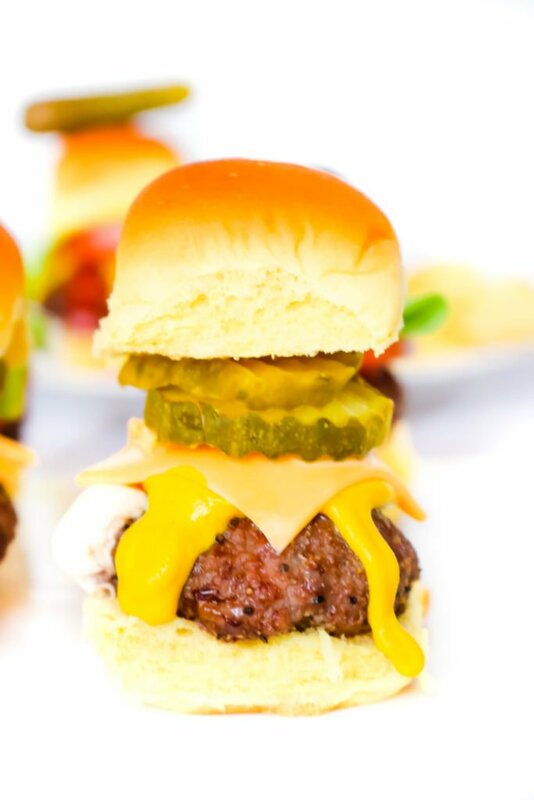 These sliders look divine! This is my kind of weekday lunch! These look delicious. Definitely adding to my hosting menu! This is making me hungry!! 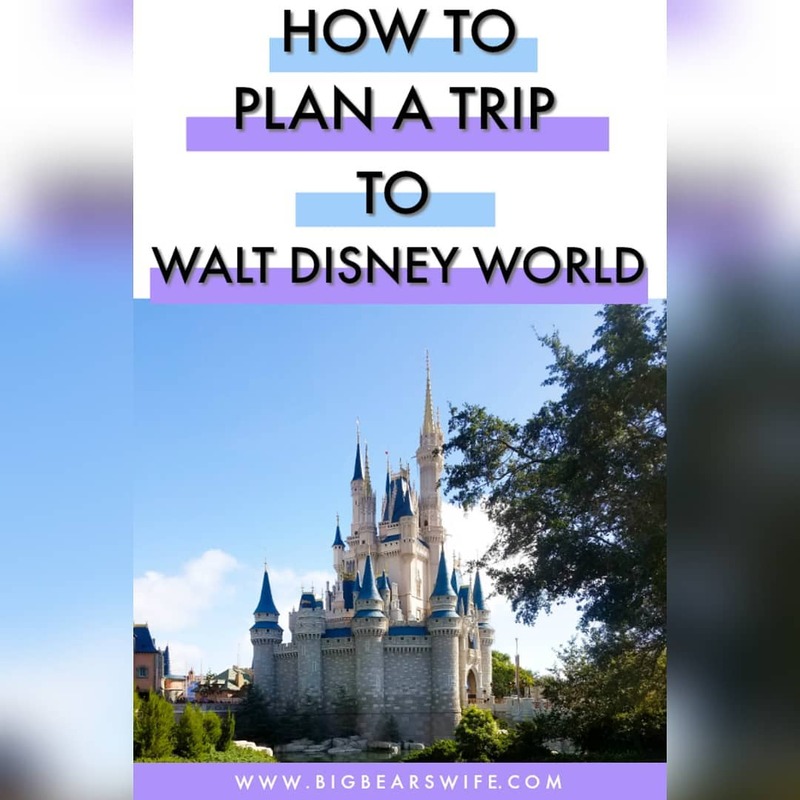 Definitely a must-make! I am with you on cheeseburgers. I love super sharp cheese in mine. OK any cheese almos will do, I love cheese! I have not air fried burgers but it does make perfect sense. I would think letting them stay warm in an oven woould work very well and you are right these sliders are the perfect size. 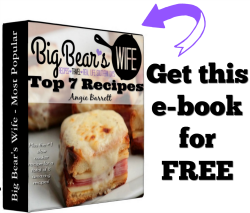 Wow, is there anything the air fryer can’t do! ?